EU-US Privacy Shield Audit and Assessments; we are ready when you are! Expand your business into EU-US markets while minimizing performance and operational risks with our industry-leading, innovative, and cost effective EU-US Privacy Shield certification services. 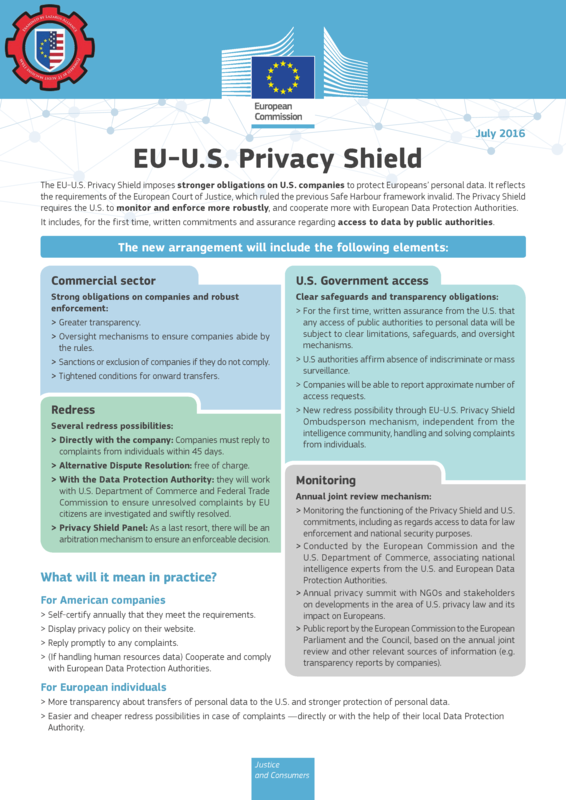 Lazarus Alliance provides EU-US Privacy Shield certification advisory and assessment services for public, private, and community organizations quickly, sustainably, and affordably. The decision by a U.S.-based organization to join the Privacy Shield program is entirely voluntary. However, once an eligible organization publicly commits to comply with the Privacy Shield Principles, that commitment is enforceable under U.S. law by the relevant enforcement authority, either the U.S. Federal Trade Commission (FTC) or the U.S. Department of Transportation (DOT). To be assured of Privacy Shield benefits, an organization must re-certify annually and report to the Department of Commerce that it agrees to adhere to the Privacy Shield Principles, a detailed set of requirements based on privacy principles such as notice, choice, access, and accountability for onward transfer. Lazarus Alliance will lead your organization successfully to the certification and help maintain annual re-certification using ITAM (Our proprietary SaaS platform). While joining the Privacy Shield Framework is voluntary, once an eligible organization makes the public commitment to comply with the Framework’s requirements, the commitment will become enforceable under U.S. law. All organizations interested in joining the Privacy Shield Framework should contact Lazarus Alliance for a review of its requirements in their entirety. This will help you determine if adhering to the Privacy Shield is right for your organization. Is Your Organization Eligible to Participate in the Privacy Shield? Any U.S. organization that is subject to the jurisdiction of the Federal Trade Commission (FTC) or the Department of Transportation (DOT) may participate in the Privacy Shield. The FTC and DOT have both committed that they will enforce the Privacy Shield Framework. Generally, the FTC's jurisdiction covers acts or practices in or affecting commerce by any "person, partnership, or corporation. "; The FTC does not have jurisdiction over most depository institutions (banks, federal credit unions, and savings & loan institutions), telecommunications and interstate transportation common carrier activities, air carriers, labor associations, most non-profit organizations, and most packer and stockyard activities. In addition, the FTC's jurisdiction with regard to insurance activities is limited to certain circumstances. Note that to be transferred in reliance on the Privacy Shield, personal data must be processed in connection with an activity that is subject to the jurisdiction of at least one appropriate statutory body we will help identify. The DOT has exclusive jurisdiction over U.S. and foreign air carriers. The DOT and the FTC share jurisdiction over ticket agents that market air transportation. If you are uncertain as to whether your organization falls under the jurisdiction of either the FTC or DOT, then please be sure to contact the Privacy Shield Team at Lazarus Alliance for more information. Schedule some time with our Cybervisors! Leveraging the Continuum GRC IT Audit Machine, Security Trifecta methodology and the Policy Machine, Lazarus Alliance provides international standards that are recognized as “Best Practices” for developing organizational security standards and controls that support EU-US Privacy Shield certifications. We want to be your partner and Privacy Shield compliance audit assessor of choice! For additional information please contact us using the form to the right or calling 1-888-896- 7580.